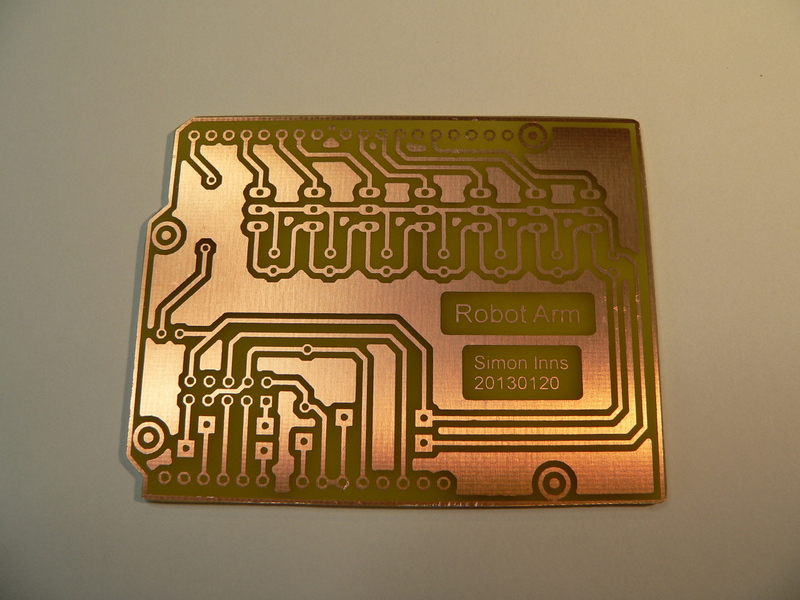 This article shows how to build your own robot arm constructed mainly from 2mm aluminium. Although it is possible to buy ready-made robot arm kits they tend to be expensive and quite small; I wanted to see if it was possible to make a good quality 6 DOF (Degrees Of Freedom) arm from aluminium bars and sheets using fairly basic workshop tools (no CNC, no 3D printer and no laser cutters). The mechanical design of the arm is based around 2 universal bracket designs along with a number of smaller brackets. The pivoting parts are made from standard hobby servos and small flanged bearings in order to keep the design as simple as possible. In order to help show the construction of the arm in as much detail as possible each part is covered by a separate section below. If anything is unclear you are welcome to ask for more details in the comments. 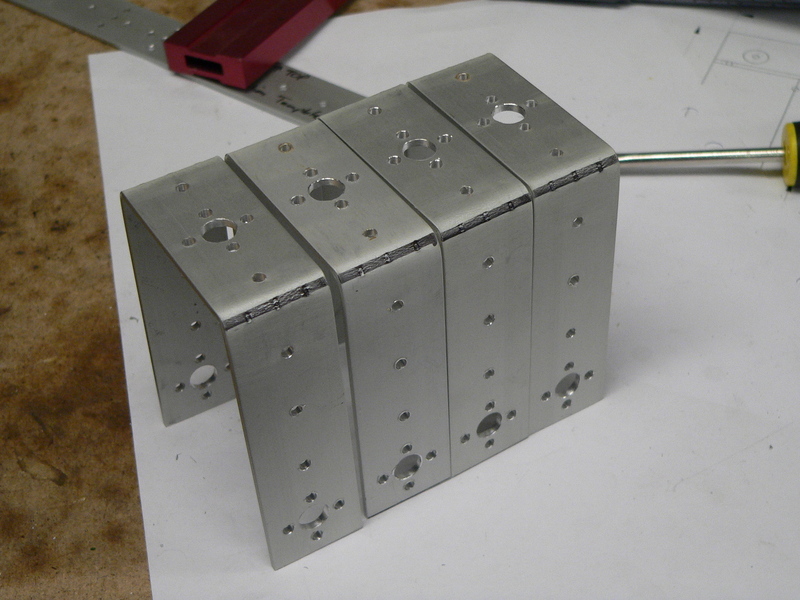 The robot arm has 3 different L shaped brackets for the mid-arm, the wrist and the end-effector mount. 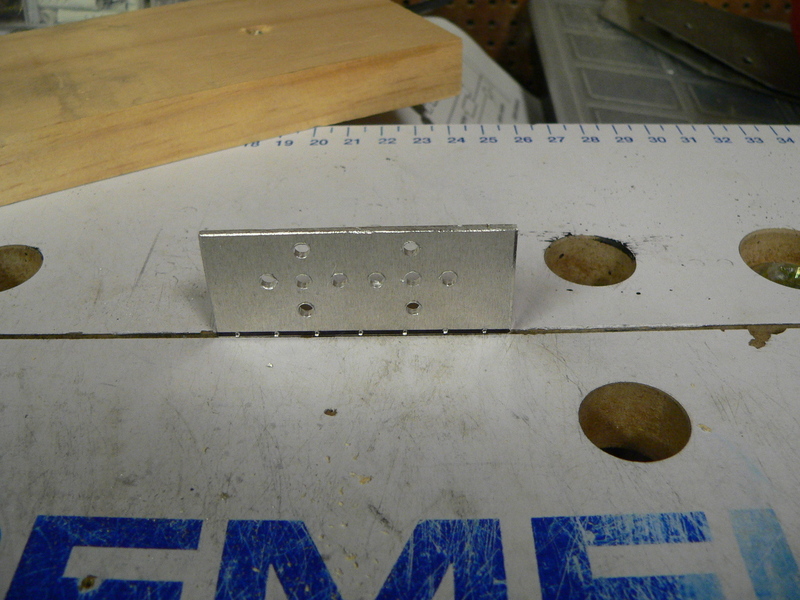 Since these brackets are all different sizes there is no need to make a jig and template. Simply cut the aluminium to size (they all use the 25mm x 1000mm x 2mm bar) and tape the CAD drawings over the cut bars. 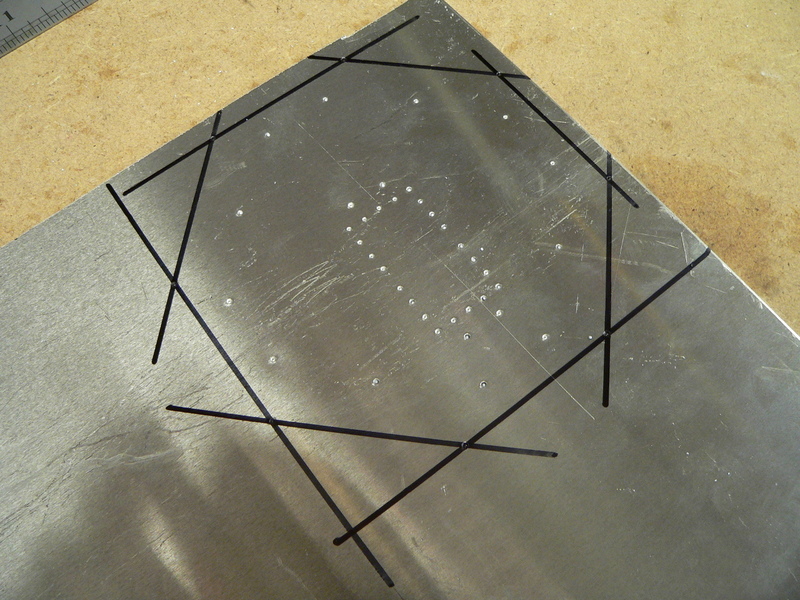 Dot-punch the template and then drill the pieces directly. As the robot arm is relatively heavy the bottom servo needs plenty of support in order to rotate the arm smoothly. 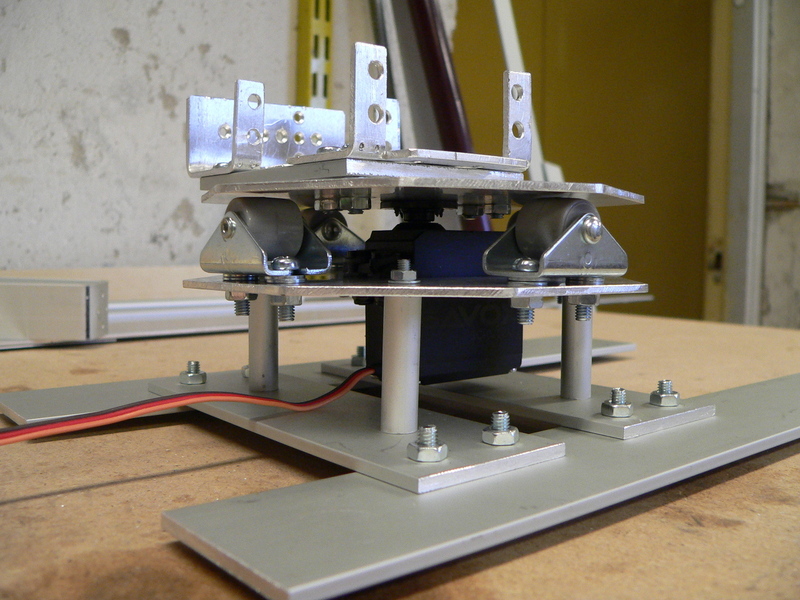 To achieve this the arm is mounted on a turntable which is supported by four casters that relieve the servo of the weight placed laterally across the servo which, unsupported, could easily twist the servo apart and damage it. The resulting shape is then cut from aluminium using a jigsaw and then filed into shape. Note the rectangular pattern in the centre of the part. 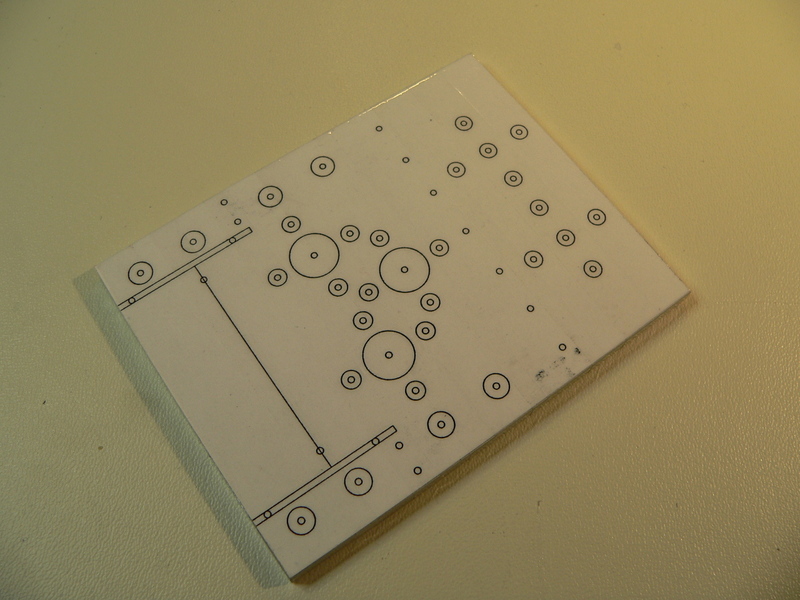 This is a drill pattern for cutting out the aluminium so that the servo can be fitted through. This part is drilled and then cut out with a Dremel before being filed into shape so that the servo fits easily in the slot. To support the upper rotating part of the turntable there are four small furniture casters placed around the outside of the part. The casters are 30x17mm with 15x14mm rollers. These are pretty common items and can be purchased from most big hardware stores. The casters are attached to the base using M4 screws and nuts. The top of the turntable is constructed similar to the base. 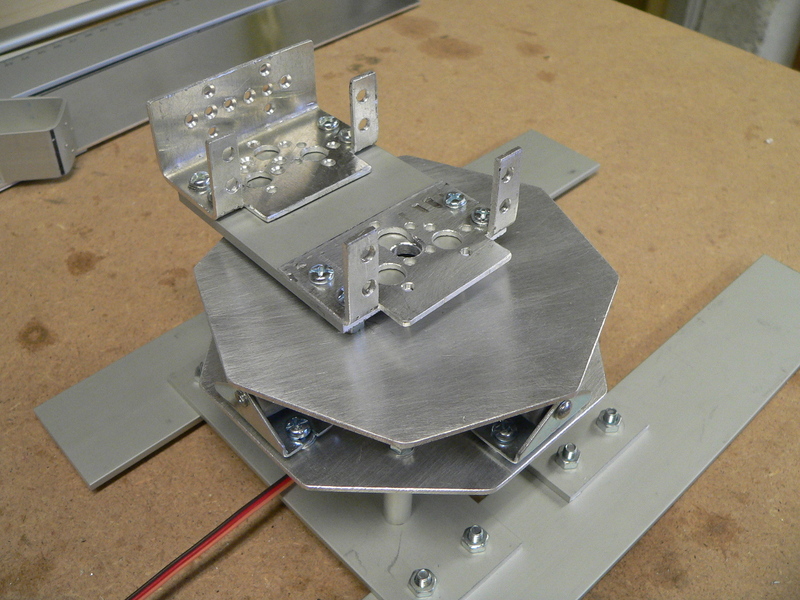 Before mounting the top of the turntable to the base one of the servo mount brackets is attached to the top. You can see the finished turntable in the following picture. 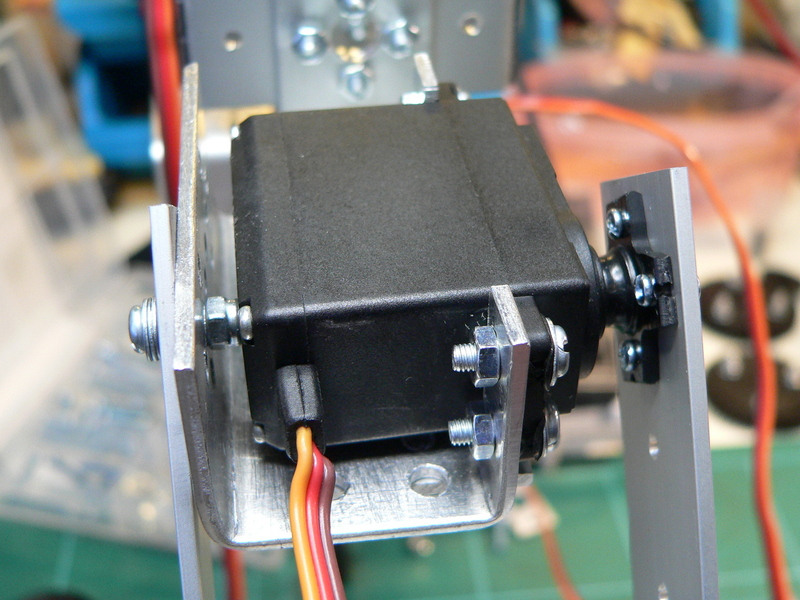 Note that the dual-servo bracket is raised slightly (on 4 M3 nuts) to give the robot arm clearance over the base when rotating the shoulder joint of the arm. 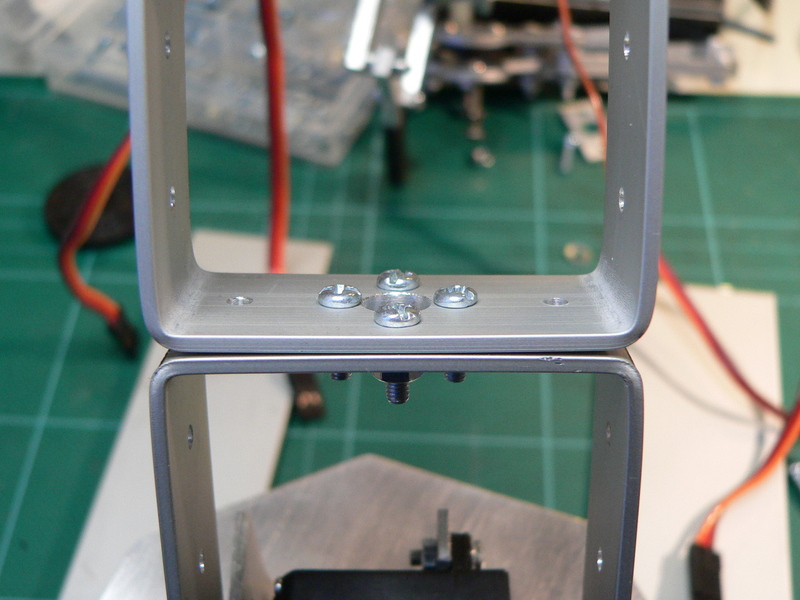 You will need to drill out the base of the servo mount to allow the servo head screw to fit though so that you can hold the top of the turntable in place. You have to make sure that the hight of the turntable is correct for the servo used. You can raise the rollers by simply using washers underneath them. 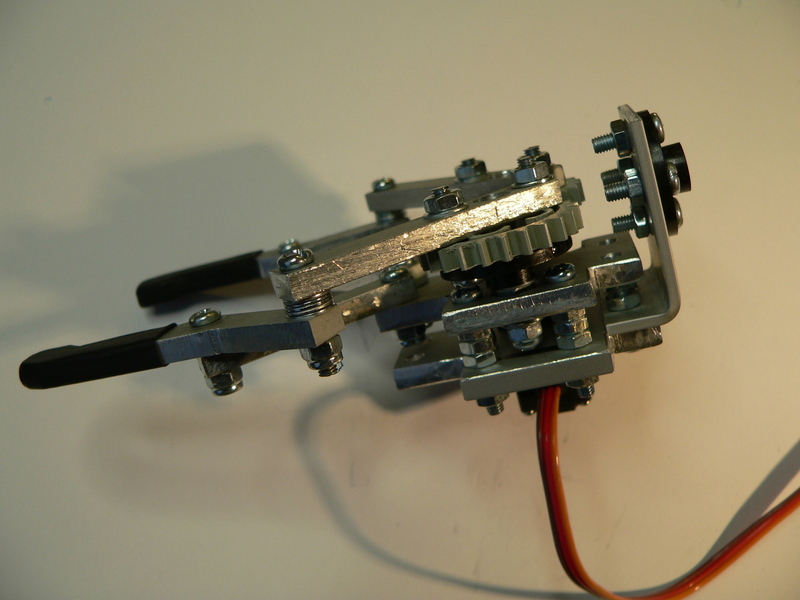 To begin assembling the arm mechanism start by bolting all the servos in place using M3 screws and nuts. As the arm requires a lot of torque to deal with the weight of the arm I used metal gear high-torque servos. The lower 5 servos (turntable, shoulder (x2) elbow and wrist) are SAVÖX SC-0252MG servos which produce 10.5kg/cm of torque at 6 Volts. The wrist-rotate servo is a Fubata S3003 standard servos which produce about 3.5kg/cm. All of the servos (except the wrist rotate) are metal-gear and dual-metal bearing to ensure that they are physically strong since the arm will place a lot of pressure on them. Once mounted in the servo brackets the servos are then connected to the C brackets. 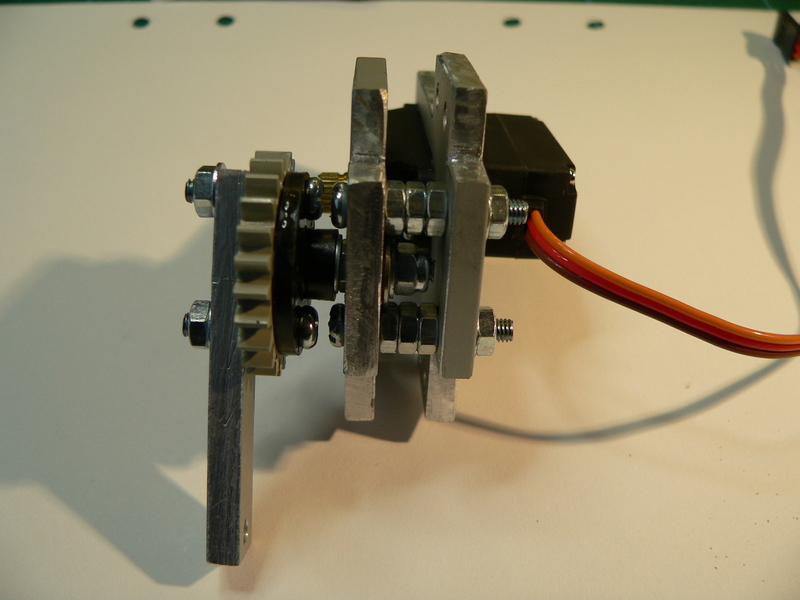 On one side the servo head is mounted using the cross shaped servo head provided with the servo. These are cut to size and then screwed/bolted in place. On the other side of the bracket a flanged bearing is fitted to the 8mm hole which is then bolted through the bracket using an M3 screw and a nylon nut to prevent the rotation from unscrewing the nut (note that the flange of the bearing is on the outside of the C bracket). 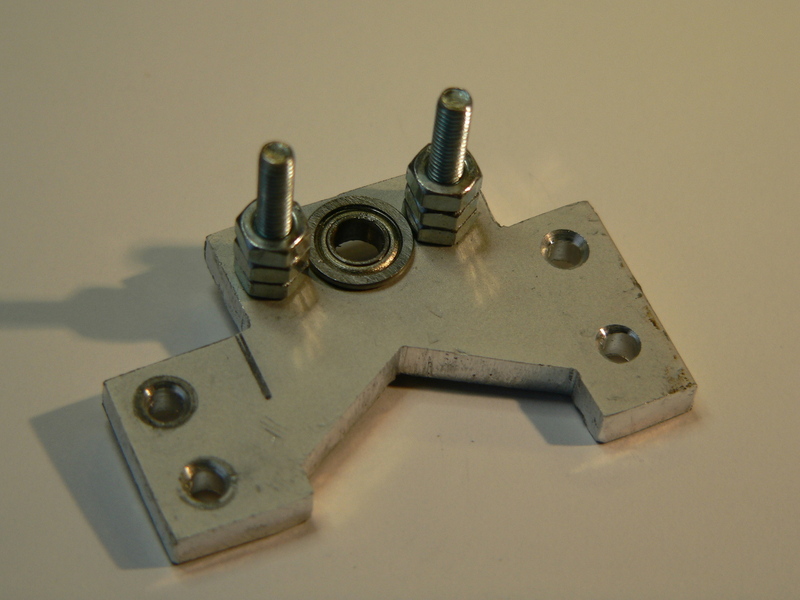 If the M3 screw is a little long you can use 2-3 M3 washers on the outside of the bracket to make sure it does not dig into the back of the servo. The bearings have an inner diameter of 4mm, and outer diameter of 8mm and are 3mm thick. The bearings are flanged meaning that they have a small metal lip on one side which prevents them from being pushed through the bracket. This type of bearing is quite common in remote control car models and can be purchased either from a model shop or from sites such as Ebay. There are 4 bearings in all, 3 in the arm and one in the end-effector (see below). 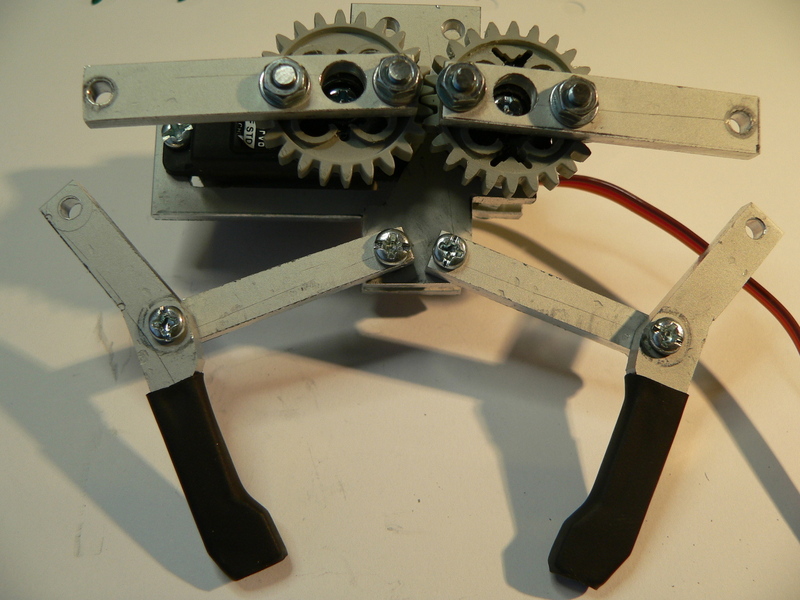 The end-effector design is based around two counter rotating gears which use levers to make the grippers open and close laterally rather than using a pincer-action. This allows the design to use relatively small parts but still achieve a open aperture of about 65mm to allow the arm to pick up quite wide objects. 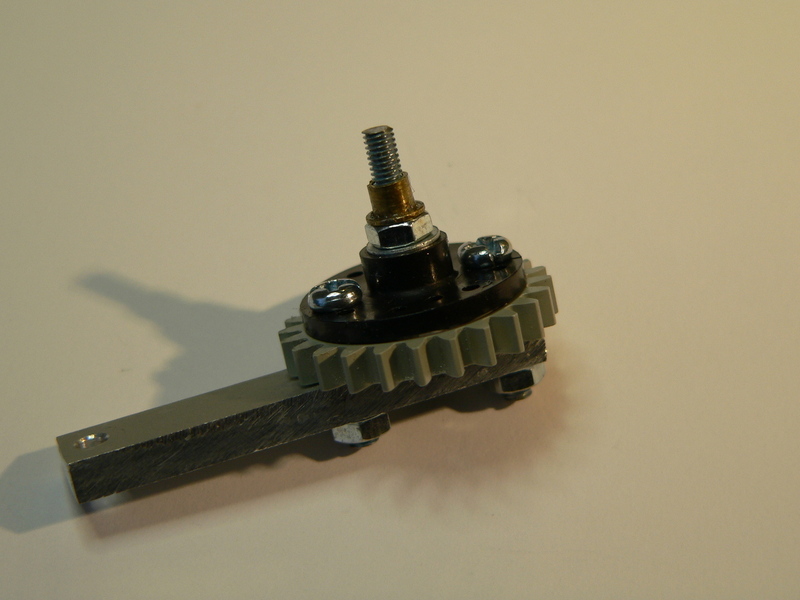 The biggest issue I found when making the effector was the gears. 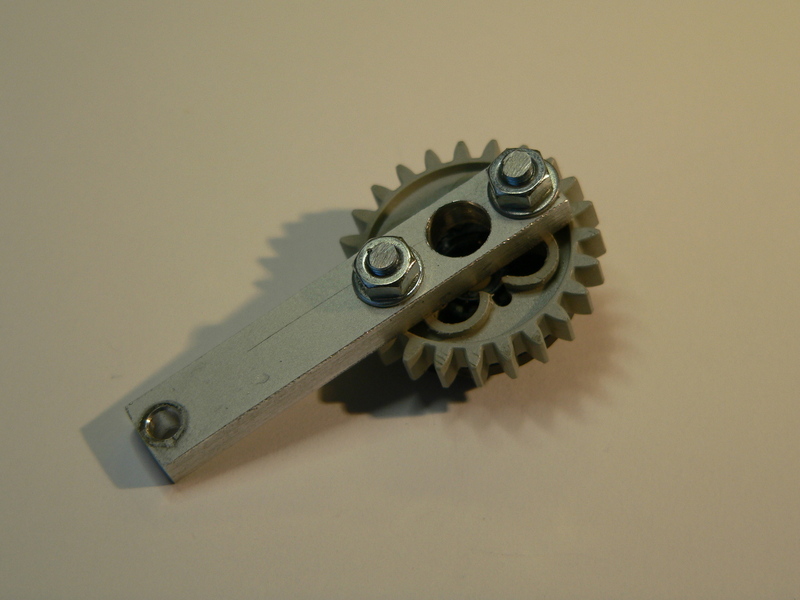 It is quite hard to find suitable gears which are easily sourced and not too large. In the end I decided to use 20mm Lego Technics gears which can be found easily in any toy store. 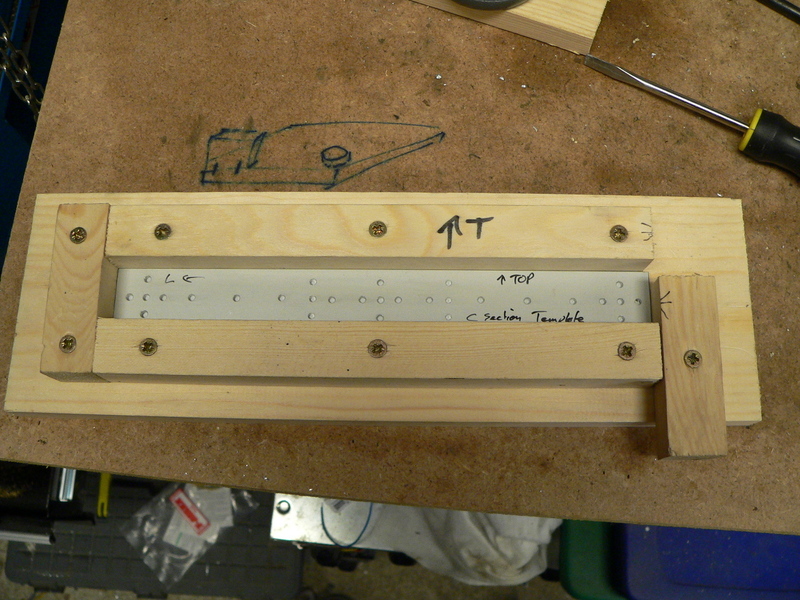 The first step is to drill two 3mm holes on either side of the Lego part. 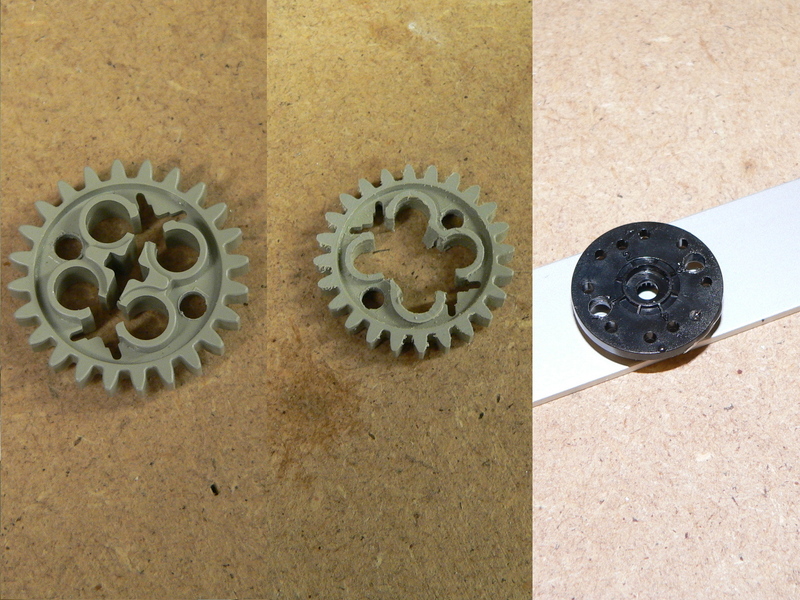 The gears I used had two handily placed mold markings which I dot-punched (very lightly!) and then drilled. Once the part is drilled you will need to file down either side of the gear to make it flush with the outer hub of the gear. To do this simply rub the gear up and down on a flat-file (I found this was easier as gripping the gear in a vice is likely to damage the teeth as the Lego plastic is quite soft). Once the part is filed flat you can then use some small side cutters to remove the inner hub of the part. This has to be removed to allow the gear to be mounted to the end-effector in a later step). Next, to mount the Lego gear to the servo and the second gear mount, you will need to drill two servo heads to fit the Lego parts. These are later bolted to the Lego part as you assemble the end-effector. 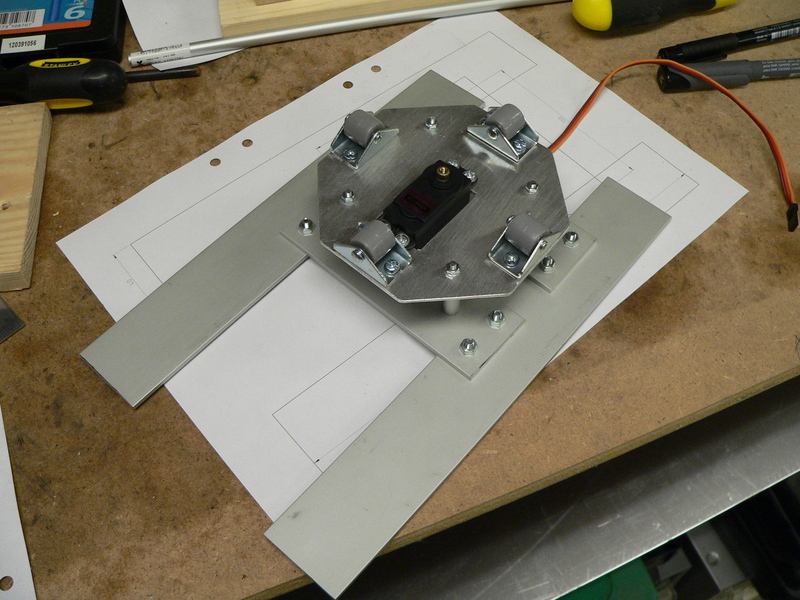 To build the end-effector you will need to print out the CAD template for the parts and cut the parts from aluminium. For the parts I used a 60mm x 1000mm x 4mm aluminium bar and cut the pieces using a combination of mitre-saw, jigsaw and a file to shape the pieces. Once the pieces are cut print out the CAD template and sticky-tape them to the parts (in the same way as making the brackets). 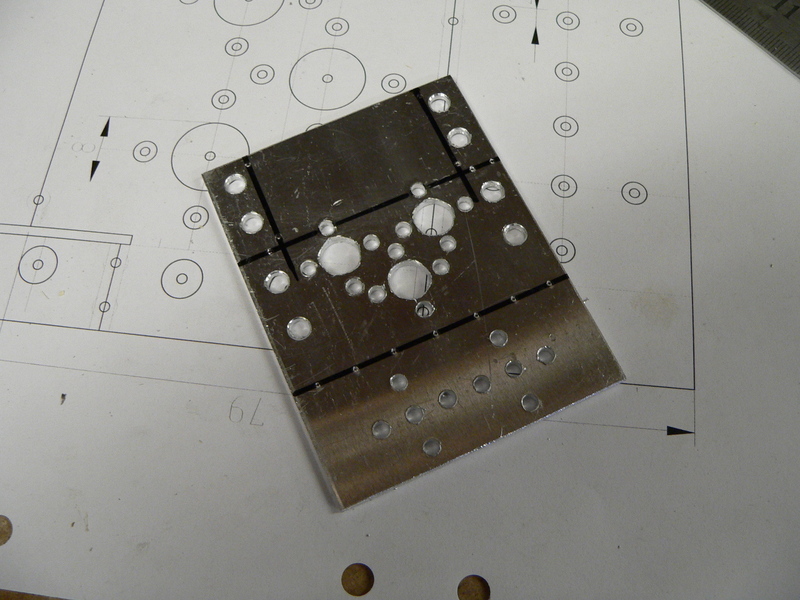 The parts are then dot-punched and drilled. 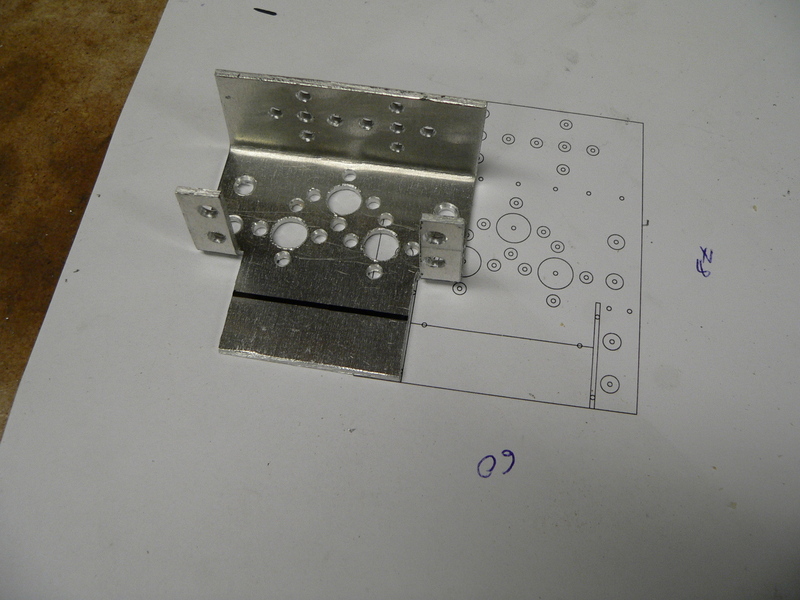 Note that, when cutting the smaller parts, having everything perfectly square is not terribly important; as long as you dot-punch and drill according to the CAD diagrams the holes will be the right distance apart and the mechanism will work. Now you can attach the end-effector to the arm. Don’t forget to screw it in place to the wrist-rotate servo. 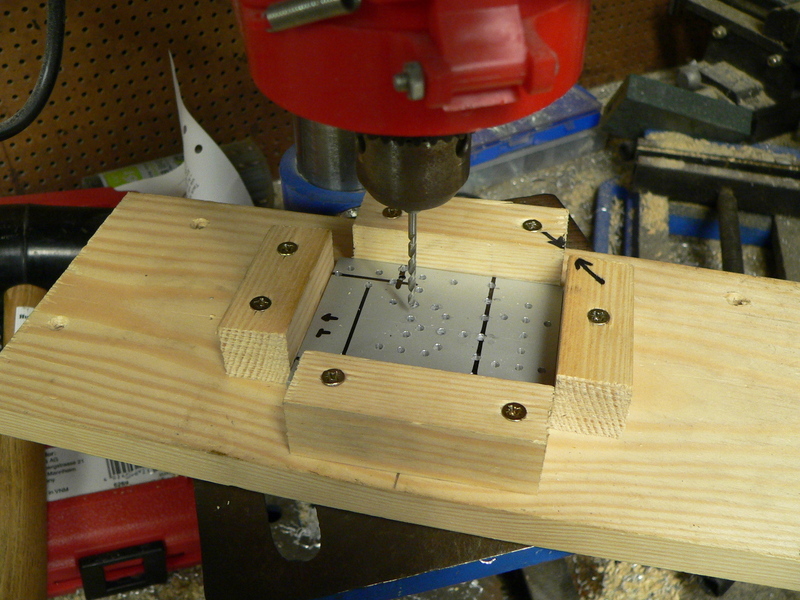 The bracket is raised just enough so you can get a screw driver into the servo head. 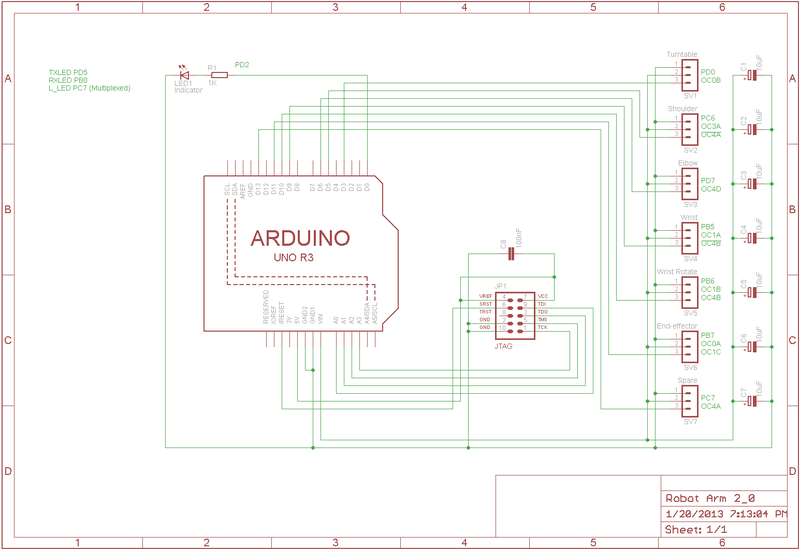 To keep the electronics as simple as possible to build I designed the control circuit based on an Arduino Leonardo (i.e. as an Uno R3 compatible shield). The Leonard board has an ATmega32U4 AVR microcontroller with built-in USB. This allows you to build a fully USB capable device without the hassle of soldering surface-mount components. Since I wanted to supply 6Vs to the servos (to get the maximum torque) the custom ‘shield’ simply supplies Vin to the servos. The LDO regulator on the Leonardo ensures that the rest of the circuitry gets a steady 5Vs. The issue with hobby servos (especially high torque servos) is that, under load, the current consumption can be pretty high. Most tests performed on the web conclude that the peak draw is around 400mA per servo. Allowing for a little head-room (i.e. 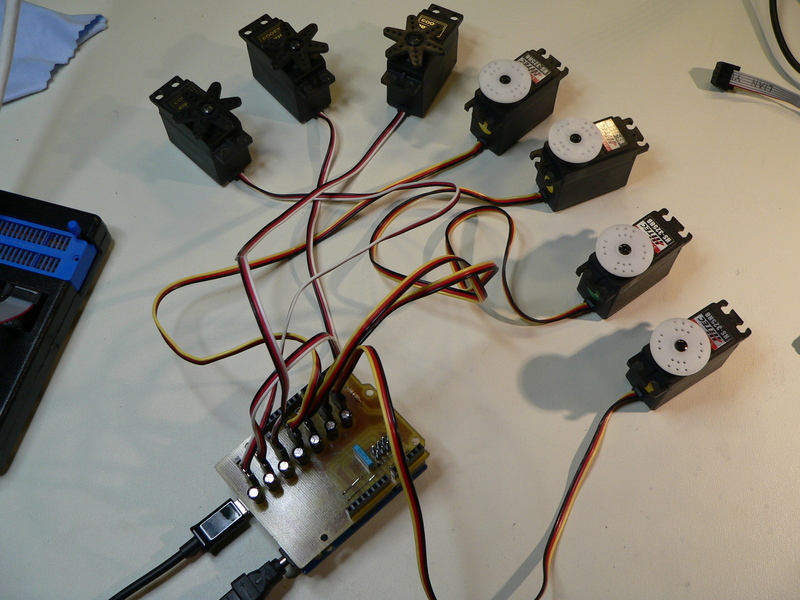 500mA per servo) and the fact we have 6 servos, the power supply needs to be rated at over 3 Amps in order to do the job. I sourced a regulated 6-15V PSU from a local electronics store which can supply 5 Amps at 6 Volts, more than enough for the job. This supply is directly connected to the Leonardo’s power connector. It’s a good idea to pick a PSU with both overload and short protection, as this will help save your electronics if (when) you make a mistake. Since the servos are directly connected to the Vin on the Leonardo you should not use a PSU which is rated above 6 Volts. Doing so will permanently damage your servos! To make the shield as generic as possible I placed 7 servo output connectors on the board (one for each PWM output on the Leonardo). 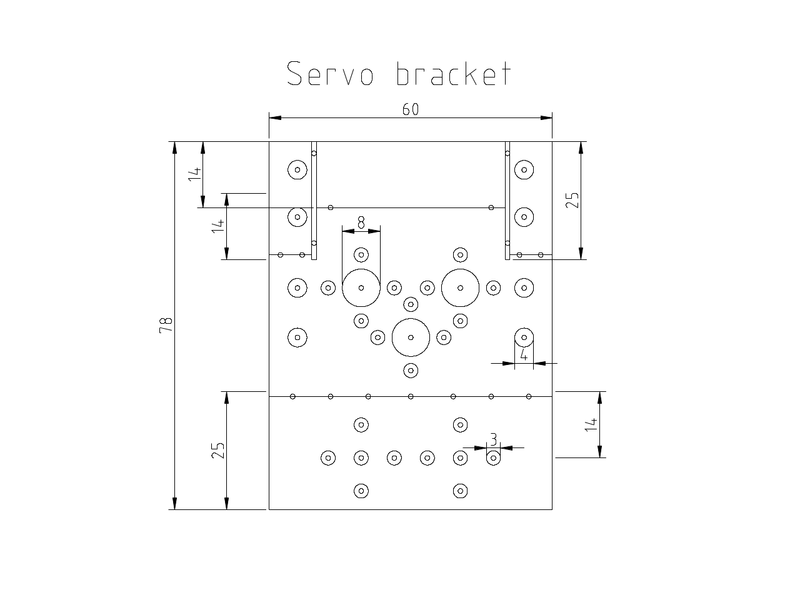 This means that you could use the shield design for any project requiring 1 to 7 servos. In addition I added a single LED for indicating status and a JTAG header. The JTAG header allows for more flexible programming and debugging if you have a JTAG programmer (such as the AVR Dragon). Since servos can be very noisy on the power-rails I included a 10uF capacitor in-line with the power output to each servo to help deal with the peaking of the servos when starting up. There is also a 100nF capacitor in-line with the JTAG header to assist decoupling of the power-rails. This project is still work in progress. The software design will be added shortly. 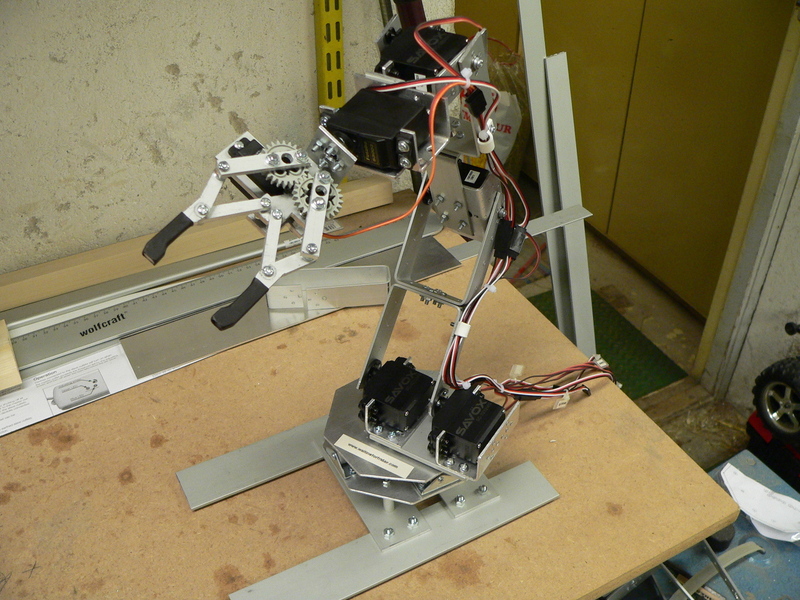 This article is part of an ongoing project to build a complete robot arm. Still to come is the software which I will be publishing shortly. So far I have tested the mechanics of the robot arm using a standard R/C radio control system to verify that everything moves correctly and that the servos can handle the load of the arm. 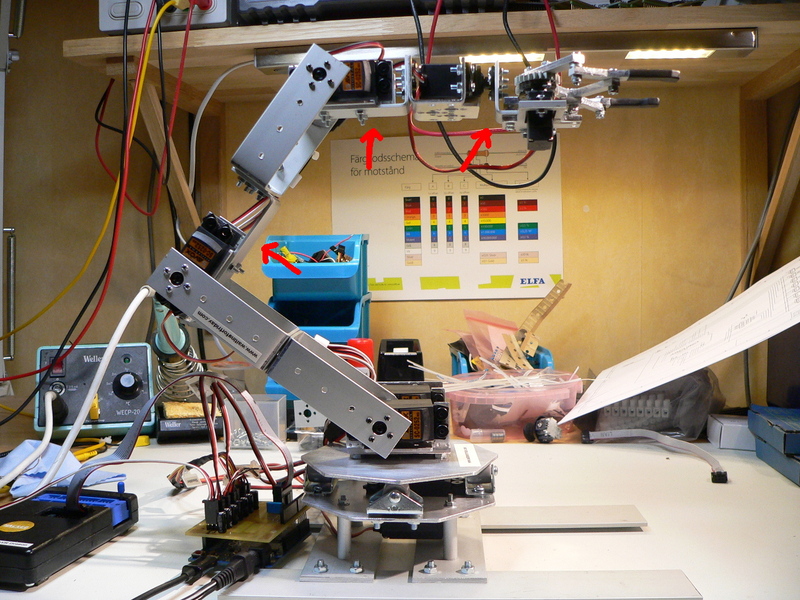 The shoulder servo seems to be strained when the arm is extended flat out from the shoulder, but further testing is needed to see if a bigger servo is necessary. Update 2013-01-21: I’ve finally got the fully servo control running enough to really test the arm and the shoulder servo cannot lift the arm from a flat-out 90 degree angle. This means I need to change the turntable design to either add another servo to the shoulder or replace it with a bigger servo. I will post an update shortly. The servo firmware is now running with rotational speed control; it’s just the servo rotation ramp-up and ramp-down which still needs to be implemented. 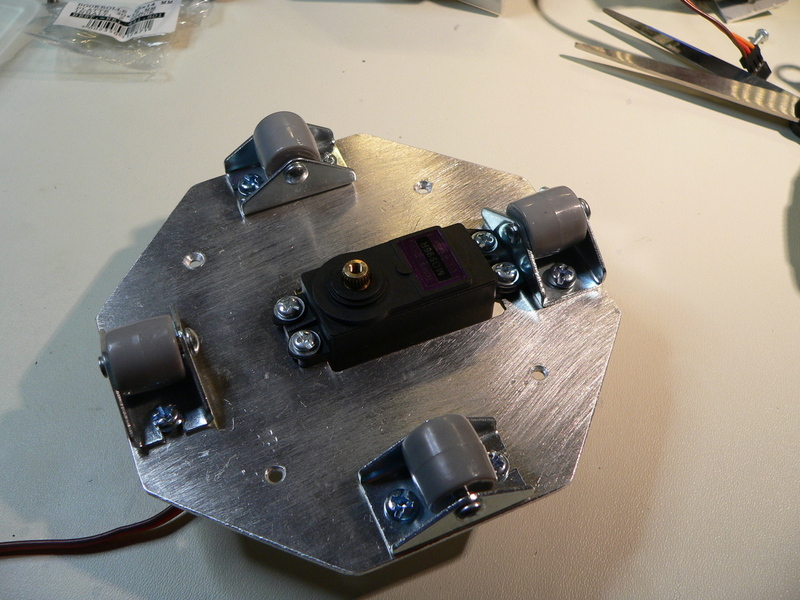 Update 2013-01-24: The turntable has been redesigned for simple dual-servo mount and I have replaced all the TowerPro servos (which performed really badly) with Savöx servos which work much better. Now the modified arm can lift even fully extended from angle straight out from the turntable. 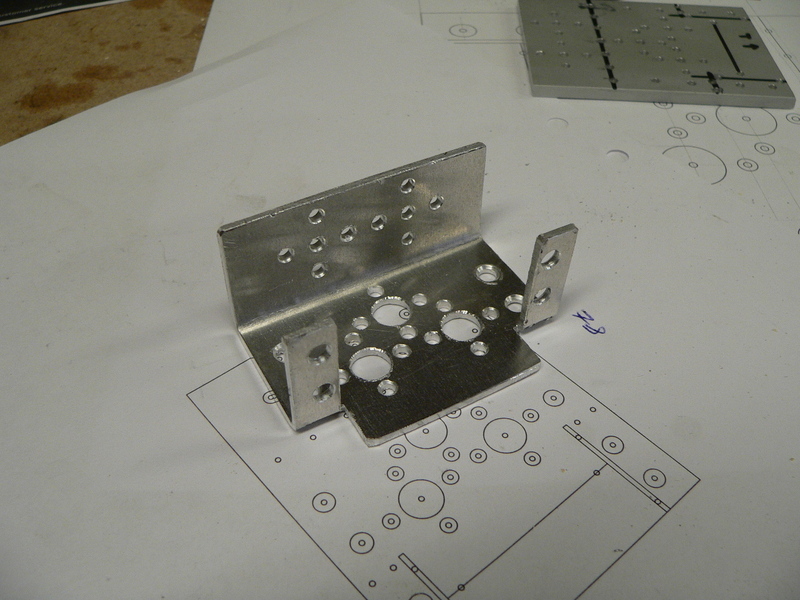 I have also updated the pictures and included the CAD for the new bracket. I wondering if there is any updates on the software/electronics sections of this project. The hardware has been relatively simple to prepare, but I want to make sure I use the correct servos and Arduino components. I will have to buy my own Arduino prototyping shield — as I do not have the means of making one away from school (WashU in St. Louis). I am on break in SLC, UT trying to complete this project with my 84-yr old grandfather. He really enjoys working with hardware — he used to weld fuel tanks on the Project Mercury rockets back in the day — and has taken to this project with more enthusiasm than I have seen in years. If possible, can I get a compact list of all electronic/software components used? I want to make sure I am getting the right equipment before I purchase anything. He has already begun constructing the hardware and is getting very close to completing all the pieces from PDFs you have provided, so the sooner I can get electronics/software components in progress, the better! Coding in Arduino is likely all he will need me for, but I leave town in 12 days so I need to get electronics soon if we are to complete the project. Regardless, this was a great post!!! His response to working on it with me has been nothing short of blissful. I thank you for that. If you download the eagle CAD files you can produce a bill-of-materials directly (there is an option in Eagle to do this). 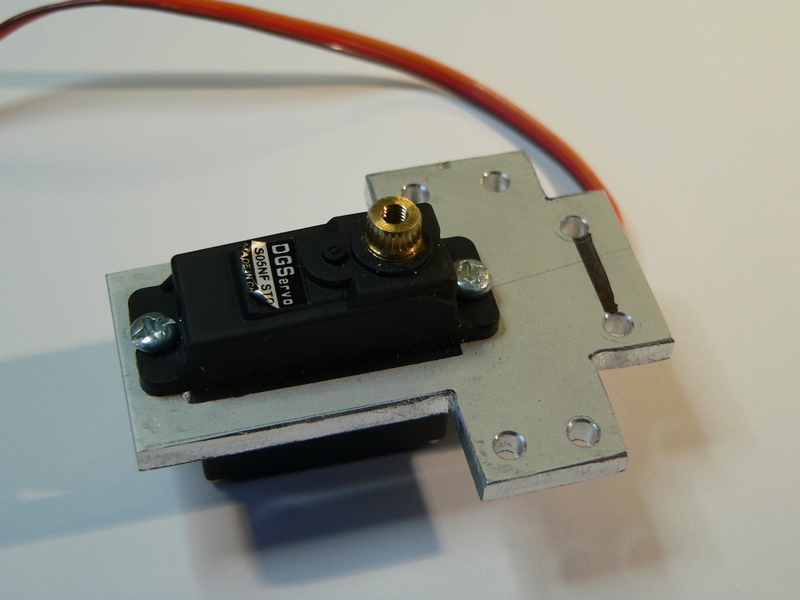 As for the servos, any standard servo with the right torque will do, they just need to be the standard size (rather than micro, or over-sized). I’m afraid I never quite got round to the software, but there are a number of servo driving libraries available for the Arduino and, since it’s just a collection of standard servos (and extension cables), they should all work perfectly for you. As a note, there are also a number of ready-made servo control boards available; you might find it easier just to grab one of those.